In the ASSIGNMENTS tool, click the Add button to add a new assignment. In addition to standard assignments, you are also able to create Group assignments and Peer Review assignments. The title of your assignment, which should be something descriptive and unique, as this is the title students will see when they go to the Assignments tool to submit their work. A description of the assignment. If this option is selected, students must check off a box agreeing to the following statement: "I have neither given nor received aid on this assignment" when submitting an assignment. When you create a new assignment, the Open Date will default to the current day, and the Due Date and Accept Until Date will default to one week later. Change the dates using the calendar icon to bring up the date-picker pop-up calendar. The "Open Date" for your assignment is when it becomes available for students. The "Due Date" is the deadline to turn in the assignment. The "Accept Until" date allows you to accept late submissions after the Due Date. If you do not accept late submissions, you may leave the Due Date and Accept Until Date the same. Note: Any submissions received after the Due Date but before the Accept Until Date will be marked as late. Add an announcement about the open date to Announcements: automatically posts an announcement to the site regarding the open date for the assignment. Enabling this option also allows you to send out an email notification for the announcement. You may display your assignment to everyone in the site, to individual members of selected groups, or to selected groups as a group assignment. Each individual member of the site will allow everyone in the site to access and submit to the assignment. This is the default option when creating an assignment. Each individual member of the selected group(s) will limit access to the assignment to the individual users in the selected groups. Selecting this option will expand to show a list of all existing groups in the site. Select one or more groups to display the assignment to those groups only. The selected group(s), as a group assignment will allow any member of a group to submit an assignment on behalf of the group. By default, the same grade is applied to all group members when the item is graded, with the option to provide individual grades as well. For more information about Group assignments, please see Group assignment. 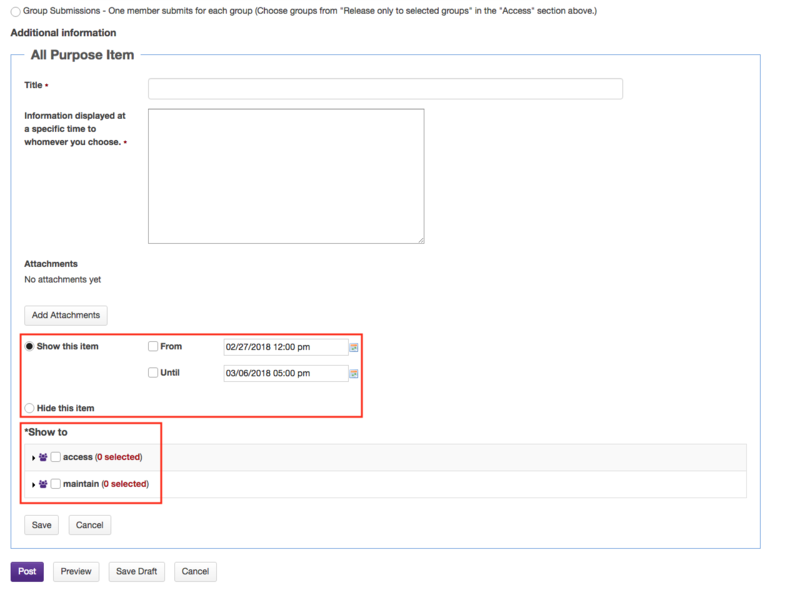 Note: You must have existing groups in your site in order to select groups to appear. To learn how to create groups, see How do I create groups? Note: You cannot enable both Peer Review Assignment and Group Assignment for the same assignment. Choose the submission format from the dropdown menu. "Inline only": Student may only submit a response by entering their content into the rich text editor. The attachment option is not available. This is a good option to choose if you want to be able to grade all of the responses online without having to download or open any files. "Attachments only": This format removes the rich text editor option and leaves only the attachment option available. "Inline and Attachments": This is the default format and it allows students to either enter content into the rich text editor inline, or attach a file, or both. "Non-electronic": This format choice is for assignments that you expect students to submit in person, while giving you the option to display assignment details, provide feedback, or assign a grade in OWL. "Single Uploaded File only": If you want students to submit a file, but you only want a single file, this is the option to choose. By default, students can only submit to an assignment once. 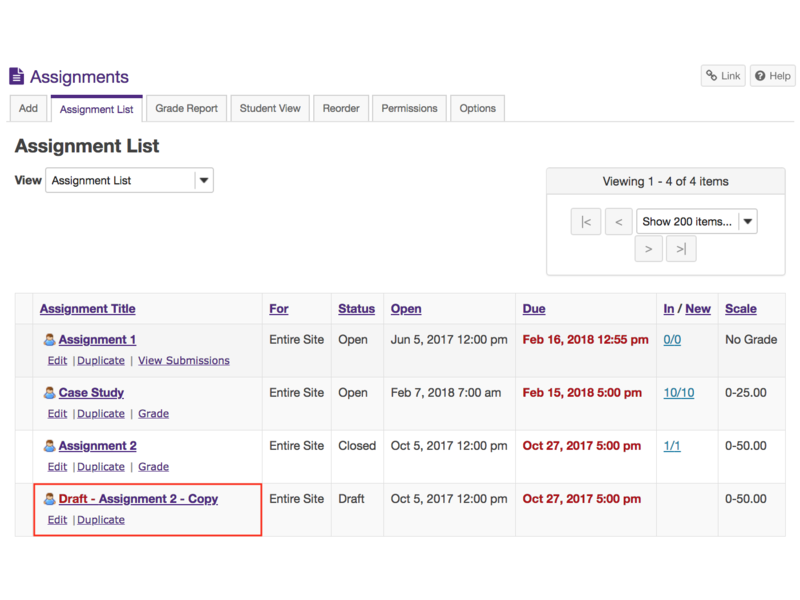 Enable "Allow Resubmission" to allow students to submit multiple times to an assignment. This can be useful in correcting errors or making changes based on instructor feedback. The number of resubmissions allowed. Whether students will be notified via email when the grade is released and resubmission is available. To learn more about allowing resubmissions for individual students, see How do I grade an assignment? Note: The "Resubmission Accept Until" date can be set after the Accept Until Date, but assignments resubmitted after the Due Date will be marked late. Note: A student can only resubmit to an assignment if they had an initial submission before the Accept Until Date. Note: The notification email message will be sent to your Western or external email associated with your OWL user account. Enable Turnitin and adjust settings. Turnitin in a plagiarism service which checks student content against a database of other works to ensure originality. To enable this feature, check Use Turnitin. For more information, see How do I enable Turnitin in an assignment? Choose the grade scale from the dropdown menu. "Points": Allows you to assign points to an assignment for grading. This is the option you should choose if you plan to send the assignment to the gradebook. "Letter grade": You may select this option if you like to grade your assignments by letter grade only. "Pass/Fail": Designates an assignment as pass/fail. "Checkmark": Allows you to mark assignments with a checkmark for completion. Note: The only grade scale option that can be added to the gradebook automatically is "Points". If you select "Points" as the grade scale, you must enter a maximum number of points for the assignment. Anonymous Grading: This will hide the identities of the students while grading the assignment. 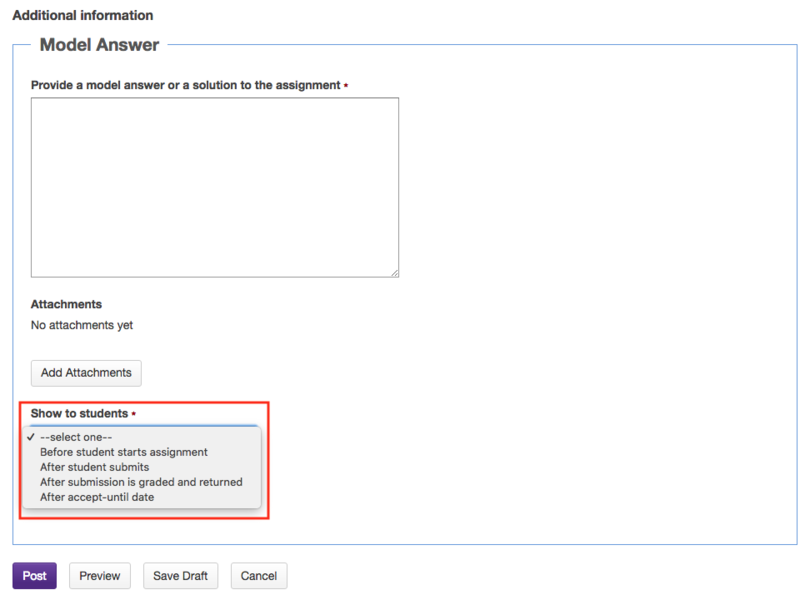 Add assignment to Gradebook: This will send assignment to gradebook, giving you the option to create a new item in the gradebook with the same name as your assignment title or associate with an existing item. 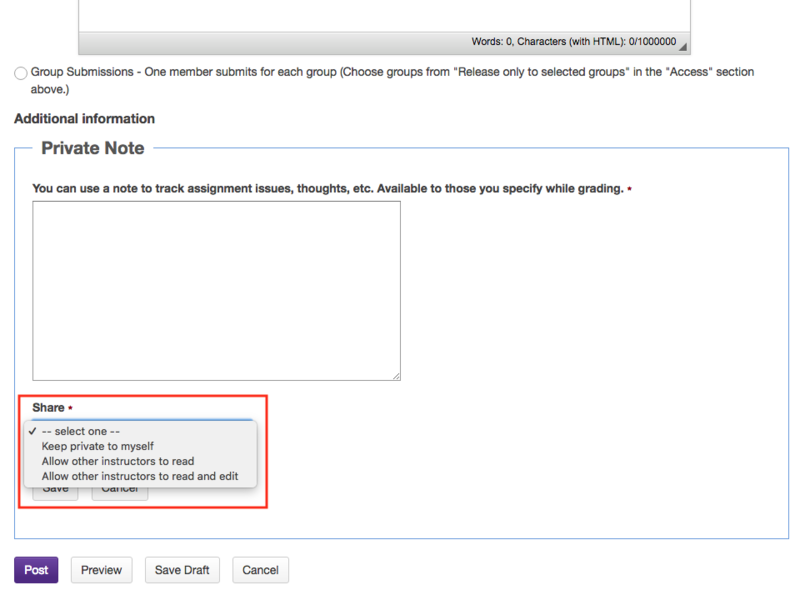 Associate with existing Gradebook entry: This will link the assignment to an existing gradebook item. This is useful if you have already created items in your gradebook and you want to use one of them, rather than creating a new assignment. You may only link an assignment to a single gradebook item, and vice versa. If you select the Use Peer Assessment option, you can allow student-to-student evaluation. To learn how to set up a peer-reviewed assignment, see How do I create a student peer review assignment? WARNING: Student identities will only be hidden on the OWL interface when Anonymous Grading is enabled. Students should not include any self-identifying information in their submissions. Select released grade notification settings. Add an all purpose item. 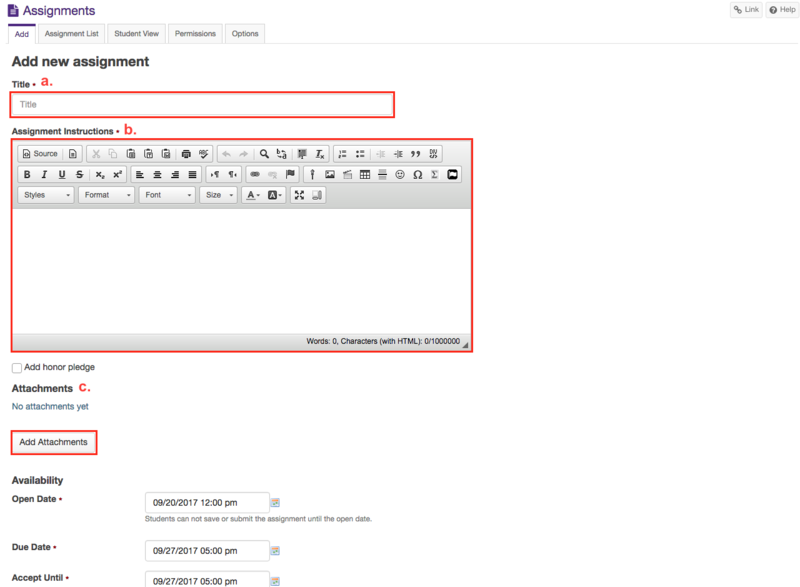 If you would like to save your progress without posting the assignment, click Save Draft. How do I enable Turnitin in an assignment? Check Use Turnitin to expand more options. If you have already created an assignment with which you wish to use Turnitin, you can click Edit underneath the corresponding assignment, found on the Assignment List view. Turnitin will only accept MS Word (.doc), WordPerfect (.wpd), PostScript (.eps), Portable Document Format (.pdf), HTML (.htm), Rich Text (.rtf) and Plain Text (.txt). File size may not exceed 20 MB. Text-only files may not exceed 2 MB. Files that are password protected, encrypted, hidden, system files, or read only files cannot be uploaded or submitted to Turnitin. 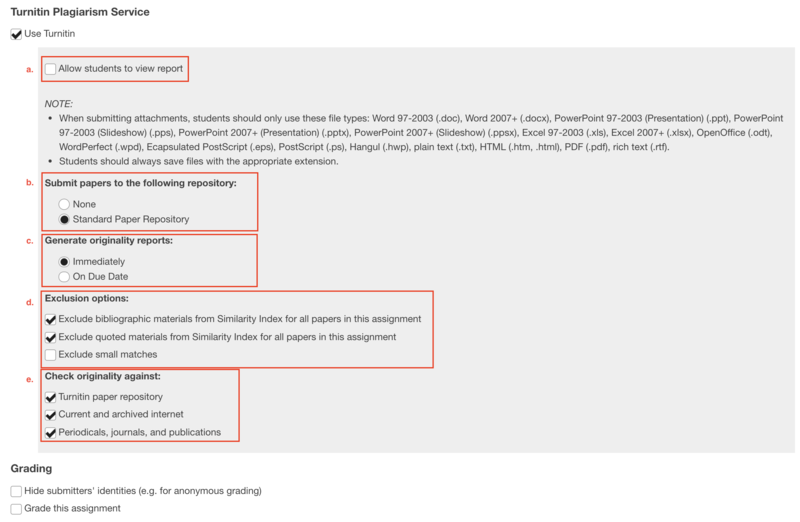 Selecting Allow students to view report allows students to view the plagiarism reports generated by Turnitin. If you would not like these reports to be accessible to students, leave this boxed unchecked. By default, Standard Paper Repository is selected, which means assignment submissions will be collected into Turnitin's repository for future submissions to be compared against. If you would not like to submit to this repository, select None. Set time to generate reports. If you choose to generate originality reports Immediately, Turnitin will check the submissions for plagiarism as soon as they are entered into the system. If you would like plagiarism reports to be generated once the due date for the assignment has been reached, select On Due Date. Here, you can determine what kinds of content will be considered plagiarism in the submitted assignments. By default, both Exclude bibliographic materials from Similarity Index for all papers in this assignment and Exclude quoted materials from Similarity Index for all papers in this assignment will be checked off. You may also choose to Exclude small matches. You can decide whether you would like submitted assignments to be checked against the Turnitin paper repository, Current and archived Internet, and/or Periodicals, journals, and publications for plagiarism. How do I duplicate an existing assignment? In the Assignment List, click the Duplicate button for the assignment you want to edit. Note: The duplicated copy will be saved as a draft. You will need to publish this copy for students to be able to view it. To post the assignment, click on the title of the draft, then click the Post button at the bottom of the page.